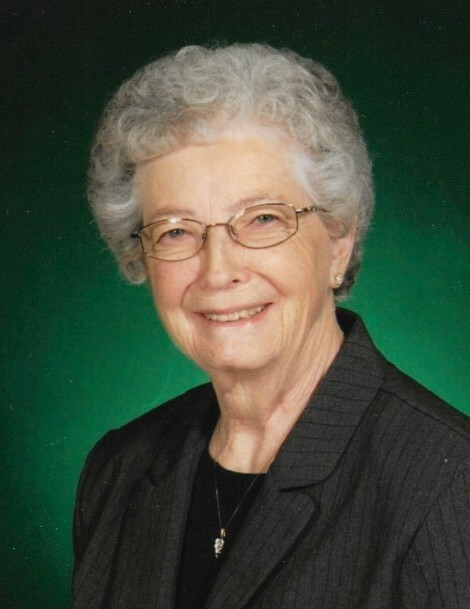 Charlotte Faye (Nealy) Hanson, 84, passed away Wednesday, February 6, 2019 at Liberty County Care Center in Chester of natural causes. Funeral services will be Saturday, February 16, at 10:00 AM at Bethel Lutheran Church in Joplin. Charlotte was born May 23,1934 in Henry, Nebraska to Lavern and Mabel Nealy. She was born on her mother’s birthday and joined 5 sisters; Evelyn, Harriet, Marge, Rose and Karen and 3 brothers; Leonard, Boyd, and Monty. She was the middle child. She attended a one room country school and her mom made her and all her siblings’ clothes. From Henry they moved to Lymon, NE where she started high school and then to Melbeta, NE where she graduated in 1951. After graduation, she worked at the lunch counter at Woolworth’s in Scottsbluff and then went to work at the Methodist Hospital running the switchboard and doing some bookkeeping. In March of 1953, her parents moved to Chester. She later joined them, leaving her job at the hospital where her boss wrote her a letter saying he would hold her job because he knew she wouldn’t be happy in Montana with all the cowboys and Indians. She always kept that note as keepsake. Charlotte went to work at the Dime Store in Shelby until her dad came and got her and said she needed to be home. She went back to Chester and worked at the Mint Café as a waitress and later at the courthouse in the county superintendent office. While working at the Mint, she met Cliff Hanson Sr. One day he told her his son would be coming home from the service and what a wonderful guy he was. Sure enough, one morning he came in with his son, Clifford, and introduced them. Eight months later they had their first date and three months later they were married in Chester on November 3, 1954. They had two children, Curt and Connie. She and Cliff recently celebrated their 64th wedding anniversary. They have been an amazing example of an enduring love filled marriage centered around family. Cliff has been Charlotte’s caretaker for the past 5 years and has done so with lots of love and no complaints. She was blessed to have such a dedicated husband. Charlotte and Cliff continued to live in Chester and first worked with Cliff’s dad at Triangle Hardware until 1964 when it was sold. They then started Cliff’s Electric and Charlotte worked as a teller at Liberty County Bank. In 1973, they bought the Coast to Coast store and managed it until 1994 it was sold. During this time, they also started Hanson’s, a department type store, and ran that until 2003. After that, Charlotte went to work as a teller at US Bank until she retired in September 2010. In December 2018, she moved into the Liberty County Care Center. We are thankful for the wonderful care that she received and we cannot thank everyone enough who cared for her with such love and respect while she resided in the nursing home. Charlotte loved her family and was happiest when she was surrounded by them. She loved to play cards and games; her and her siblings spent hours together playing pinochle using “Nealy” rules, cribbage, and Hand and Foot. She also enjoyed reading, doing puzzles, and crocheting. Even though she lived far from her grandchildren she stayed close to them with many phone calls and visits. She loved to spoil them, with gifts and food. All four of them thought of Granny’s house as home. Charlotte was a special person and Curt and Connie know how lucky they were to have her as their mom. She was always there for them and she was also famous for her “talks.” Curt and Connie could always tell when she had some “advice” ready to impart on them and they dreaded those conversations. Believe me, if you did something to disappoint her, she’d let you know! Christmas was her favorite time of year. Making sure to make homemade cinnamon rolls, special stockings filled with gifts for all the grandkids, and a house filled with decorations. She made sure to pass along her specialties to her children and grandchildren throughout the years. And they always did their best to be home to celebrate her favorite holiday with her. She is survived by her husband, Clifford Hanson of Chester; son, Curt (Dora) Hanson of Gering, NE; daughter, Connie (Joe) Ludwig of Chester; Four Grandchildren, Brent (Kelsey) Hanson of Denver, CO, Nick Ludwig of Chester, Courtney Hanson of Chicago, IL and Sarah (Matt) Wolfe of Seattle, WA; one great-granddaughter Brynn Hanson of Denver, CO; sisters Marge Cochran of Melbeta, NE and Karen (Herb) Englehart of Veneta, OR; brothers, Boyd (Donna) Nealy of Chester, and Monty (Bev) Nealy of Billings; sisters-in-law, Gaye Kehm of Mason City, Iowa, Sharlene Hanson of Chester, and Julie (Dave) Larson of Anoka, MN; and many nieces and nephews. She was preceded in death by her parents, Lavern and Mabel Nealy; sisters, Evelyn Henderson, Harriet Waters, Rose Ish; brother, Leonard Nealy; and 6 in-laws. Memorials can be made to Hi-Line Health Foundation in Chester, MT.